I'm the kind of crazy person who thinks it is completely acceptable to heat the oven to 500 degrees on a hot summer day. It's totally worth it for homemade pizza...right? However, if you are less inclined to spend time in a sweltering kitchen, this could also be done on the grill - I've heard that grilled pizza is fantastic. We made the pizza dough using Peter Reinhart's recipe from The Bread Baker's Apprentice. This dough is really tasty, plus the recipe makes enough for 6 pizzas (9 to 12 inch, thin crust), and you can freeze the dough to use later. This makes it easy to have homemade pizzas a lot more often. About the pesto - homemade is definitely much tastier than store bought. Right now is a great time to make some, with all the (cheap) fresh basil that is available. We make ours in big batches and then freeze it in ice cube trays. That way we can take out a couple cubes whenever we want it. Dough recipe adapted from The Bread Baker's Apprentice. Peter Reinhart offers a choice of bread flour or all-purpose flour. If you choose bread flour, you should definitely use the optional oil - this makes the dough more tender. I went with bread flour when I made this. Next time, I will try adding some whole grain flour for a heartier crust. Each of these pizzas could serve 1 - 2 people, depending on the size of the final pizzas and the size of your appetite. In the work bowl of a stand mixer fitted with the paddle attachment, stir together the flour, salt, and yeast. Add oil and cold water and mix until the flour is absorbed. Switch to the dough hook and mix at medium speed for 5-7, or until the dough is smooth and sticky. The dough should stick to the bottom of the bowl, but clear the sides. Note: this dough really is quite sticky, so don't be surprised - if it clears the sides and not the bottom, you should be okay. If the dough does not clear the sides, sprinkle in some more flour until it does. Likewise, if the dough clears the bottom, sprinkle in cold water by the teaspoon. The finished dough will be springy, elastic, and sticky. Sprinkle flour on counter and place dough on counter. Line a sheet pan with parchment paper and lightly oil the parchment (spray oil works well). Using a dough scraper, cut the dough into 6 equal pieces. Dipping the scraper in water between cuts will keep the dough from sticking. Sprinkle flour on dough and flour your hands. Gently shape each piece into a ball and transfer balls to sheet pan. (If you would like to freeze dough for later use, roll dough balls in oil, put each ball into a separate freezer bag, and freeze for up to 3 months. Put dough in refrigerator the day before you plan to use it.) If you are not freezing the dough, mist dough generously with oil and slip the pan into a plastic bag, or cover with plastic wrap. Put pan into the refrigerator to rest overnight, or up to 3 days. On the day you plan to make pizza, remove dough balls from the fridge 2 hours before making pizza. Dust the counter with flour and mist with oil. Place the dough balls on the counter, sprinkle with flour, and flour your hands. Gently press dough into disks about 1/2 inch thick and 5 inches in diameter. Sprinkle disks with flour, mist again with oil, and cover loosely with plastic wrap. Let rest for 2 hours. About 45 minutes before making pizza, place a baking stone on a rack in the lower third of the oven. Preheat the oven to the highest possible temperature (500 deg F on my oven). If you don't have a stone, that's okay. You can bake your dough on the back of a sheet pan, and you don't need to preheat the pan. Generously dust a pizza peel or back of a sheet pan with semolina flour or cornmeal. Flour your hands and use a pastry scraper to lift 1 piece of dough. Carefully stretch the dough to a 9-12 inch diameter. I do this by laying the dough on the floured pizza peel or sheet pan, and gently pressing it out. Peter Reinhart says to bounce it on your fists and toss it, but I definitely can't do that. 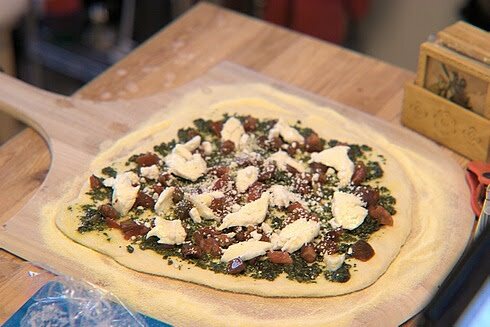 With dough on the peel or pan, add toppings to the pizza. 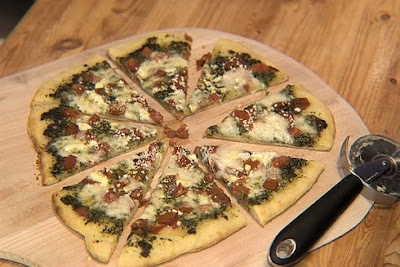 Remember that this is thin crust, so don't weigh it down or make it soggy with too much topping or sauce. For this pizza, I did the pesto first, then the tomatoes, then cheese. 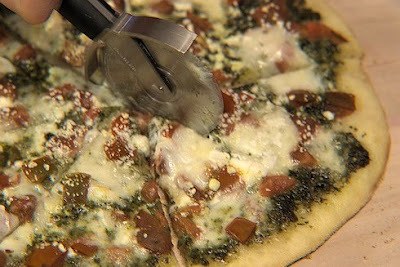 Slide the topped pizza onto the stone, or place the baking sheet in the oven. The pizza will take about 5-8 minutes to bake. If you are not using a stone, it might take a minute or two longer. When done, the bottom should be crisp and the cheese should be melted. Remove pizza from oven and transfer to a cutting board. 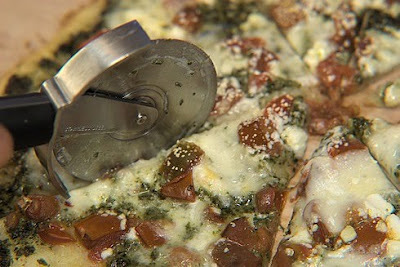 Wait 3-4 minutes before slicing - this helps the cheese to set. Let's get this thing started!